What could be better after a long day on the slopes than a hot bowl of soup? It was the inspiration behind a restaurant in Snowflake, Vermont that Lucky Jamieson’s parents opened. After their death, Lucky took over the shop, along with the mysteries that seem to boil over among the patrons as hot as the soup she serves. In the second book of the series, discovery of a Revolutionary War skeleton is trumped only by the discovery of a murdered auto mechanic, but when the Mayor of the town goes missing, Lucky is forced to get involved in all three mysteries, much to the frustration of the police chief. But can she unravel the facts before she becomes the killer’s next target? 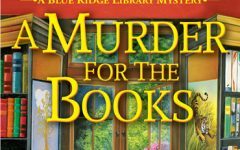 This clever series not only offers delicious intrigue, but includes delicious recipes for readers to get in the spirit of the book. This is your second book in the Lucky Jamieson Soup series. What inspired you to write about a soup shop? A soup shop just seemed perfect – what could be cozier in a cold climate? And a town like Snowflake, Vermont, buried in winter blizzards with freezing temperatures, needs something hot to warm its residents. The By the Spoonful Soup Shop, Lucky’s restaurant, is at the center of town and a nexus of gossip. It serves as a handy location for a village mystery with a regular cast of eccentric locals. Your heroine seems to be at a crossroads in her life. Do you think readers respond to a heroine finding a new path in life? I think readers want to be able to connect and identify with a character, I know I do. When I open a favorite series book, I feel as if I’m visiting a good friend I haven’t seen for a while. A protagonist’s dilemmas also echo the readers’ experiences – Yes, I’ve been there, I know what she’s going through, or thank heavens, I’ve never had to deal with that! It’s impossible to connect with either a person in real life or a fictional character who lacks vulnerability. And then the angst of being at certain crossroads in life can up the stakes for the character. Apart from any plot twists or surprises, readers want to know which choice will that character make, which fork in the road will he or she choose? Only imperfectness (is that a word?) allows for depth and the gray areas of life. You include recipes in the book. Are they your own? Are you a soup lover? I can’t say I’m the world’s greatest cook, but the recipes are mine. When I was younger, I had absolutely no idea how to cook anything. And as for soup making, I thought that had to be the most esoteric skill in the world. Eventually I figured out it wasn’t all that difficult — just broth, vegetables, meat, rice, whatever is on hand. Sometimes, I just chop up leftovers, add some water and broth and I have a new recipe. I never measure anything, so the hardest part of recreating recipes for the books was going through the steps again and remembering to write things down. And yes, I do love soup! Did you discover anything interesting in the research of this book, whether or not it made it into the final draft, that readers would like to know? Actually, lots of things. I grew up in New England, in Boston, but I’m very familiar with all the New England states. I’ve lived away for a long time, so I needed to do some research to discover what had changed and not changed since I had lived there. Originally, I had planned for A BROTH OF BETRAYAL to take place in the spring, at the end of a long winter, and being a Massachusetts native, I (wrongly) assumed that the midnight ride of Paul Revere or the battles at Concord and Lexington would be celebrated in Vermont. I was so wrong! Vermonters take great pride in the Battle of Bennington, crucial in the ultimate defeat of the British. That Battle occurred on August 16, 1777. I wanted to incorporate some of that history, so it was back to the drawing board. Broth is now set in the hot and steamy month of August. Additionally, in Broth, a very old skeleton is unearthed and I had to quickly educate myself in all sorts of things – the color of the bones after so many years, characteristics based on skull shape and eye sockets, homespun clothing of the era, rifles, bullets and so on. But the biggest shock of all came when I discovered some online articles about the New England megaliths. I’m embarrassed to admit that I never knew of, or even heard of, what are theorized to be prehistoric stone structures. If I remember correctly from my reading, there are approximately 800 in New England alone and they predate the earliest known European colonists. A former Harvard professor, Barry Fell, has written extensively on the subject, and it’s only in recent years that his theories have been treated more respectfully. But much more on that later, since the megaliths play an important part in the third book, now entitled A ROUX OF REVENGE. How many adventures are you planning for Lucky? As many adventures as possible. Lucky becomes involved in a relationship with the town’s doctor, who was her young girl/older man crush. That relationship will go through some ups and downs, just as in real life, but I could definitely see Lucky settling down with her doctor, maybe even forming a crime solving team. When I started to plot out A BROTH OF BETRAYAL, a seasonal change seemed natural. After all, the deadly winter in the first book couldn’t last forever and warm weather would eventually arrive in Snowflake. I honestly hadn’t (at least consciously) planned from the start that a different season would form the backdrop of each story, but the device took on a life of its own. Time passes as the characters grow and change, right along with the extreme weather. Will you be doing any sort of signing tour for the release, or be at any upcoming conventions where readers can get a signed copy? I have several guest blogs and giveaways coming up throughout April and into the summer. I’ll be posting these on my website. I’m also running a Goodreads giveaway which ends on April 10th. In June I’ll be attending the California Crime Writers’ Conference in Pasadena, and of course, Thrillerfest VIII in New York! After that, I hope to visit several places in Vermont – and of course, do a little more research. My website, Facebook and Twitter: @SnowflakeVT. And I absolutely love to hear from readers! Anything else you’d like readers to know, in case this is the first book they’re buying from you? I think any reader could easily connect with the characters if he or she began with A BROTH OF BETRAYAL, and the plot of course stands on its own, without reference to the earlier book. Although certainly not essential, it might be a richer experience for a reader to start with A SPOONFUL OF MURDER. In the beginning of the series Lucky is struggling with grief over the loss of her parents and worry about her grandfather Jack’s health. Her chef, Sage, is intricately involved in the plot and his past history is very much a part of the story. The first book offers readers a deeper insight into the forces that shaped these characters and how their interrelationships might evolve. Connie Archer is the national bestselling author of A SPOONFUL OF MURDER, the first in the soup lover’s mystery series from Berkley Prime Crime. A BROTH OF BETRAYAL is the second in the series. Connie was born and raised in New England. She now lives on the other coast.